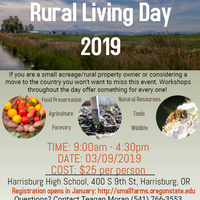 If you are a small acreage/rural property owner or considering a move to the country you won’t want to miss this event. Workshops throughout the day offer something for every one. Classes on Bee Keeping, Compost, Pasture Management, Well Water Management, Soils, Tree ID, Wildfires and more. Check back mid January for registration and complete class schedule!